This particular issue (October/November 1992) didn’t have much that inspired me to dig in and craft, but there were a few useful things. One of them was these potholders. My family uses amazing amounts of potholders, I don’t really know why, but we do. So I was excited to give this one a shot. The pattern calls for “Speed Cro-Sheen” thread, which according to my search no long exists, but Ravelry informed me was a size 3. So I hit up my local craft store and saw I could find. Aunt Lydia’s Fashion 3 seemed like it would do the trick, and came in some great colors! I didn’t think to look up the yardage per ball of the Speed CroSheen, but the pattern called for two, so I got two Aunt Lydia’s. Came home, and got to work. At first I found the pattern a bit confusing, if you attempt it there is a spot that means “in the same stitch” but didn’t say quite that. It took few mistarts for me to get going. My first center or two wasn’t coming out quite right, luckily you can just pull the thread and try again! If only life was like that! Got the pattern down, and it actually becomes very second nature. I did the second side while rarely checking the pattern. 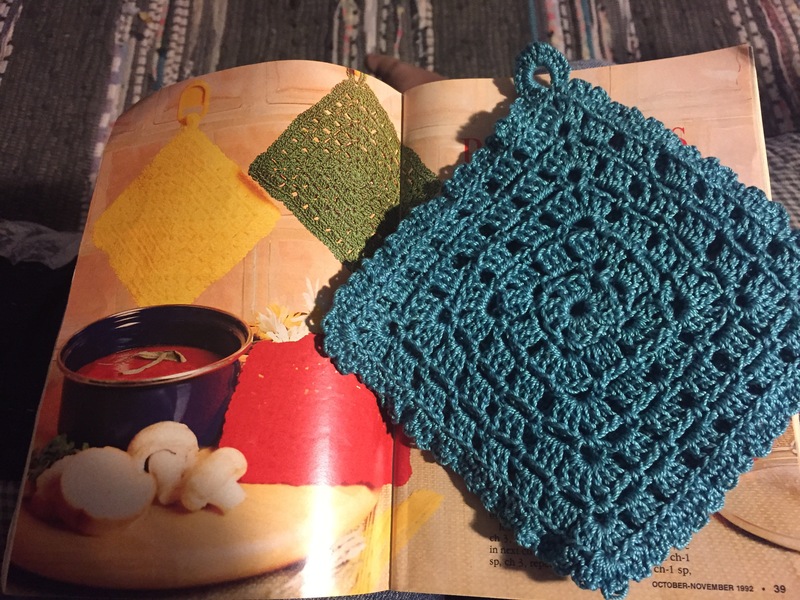 The potholder really came out great and I love it! It only took about two days of relaxed crocheting to get it finished, so it would be great for gifts, AND it didn’t even take a whole ball of thread, so I can make one, or maybe even two more. When I do I will probably make the hanging loop just a little bit bigger. I’d also like to try the pattern with cotton yarn for a dishcloth. I’ll still be starting little girl’s sweater from this issue, and have to share with you the spaghetti frittata I made. I may also start a more inspiring November issue, since I’m almost done this one already. Stay tuned! Would you please repeat the issue you are using in each of your posts? I’ll make sure to do that! I’m also tagging posts with tags that should help if you’re looking up an issue or project. For example these are all tagged 1990s, and should be tagged November. I’ll also state in each post which issue it is. Thanks! I have a post written up that is scheduled to post tomorrow, and already did it in that post, but I also went back and edited all the previous posts to make sure they said.